Can I cast Mairsil, the Pretender with a caged Havengul Lich? : You may cast target creature from a graveyard this turn. When you cast that card this turn, Havengul Lich gains all activated abilities of that card until end of turn. You would be totally right normally, but 2 cards mess this up. Since LED is so stupid powerful here I tutor it up almost every game and it is my artifact-cast every turn from then on. The 2nd card is Havengul Lich , that rainbow mana allows me to play every single creature I want from my opponents and gives me the colors to use their abilities. Since i almost never get any issues with draw I like the lantern a bit better because of these 2 reasons. It’s not a lot better but still. If you got any problems with draw the sphere is for sure the better way to go. 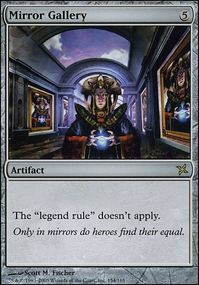 If I activate the ability of a caged Havengul Lich to cast target creature from a graveyard, can I sacrifice Mairsil, the Pretender in response (for example with Ashnod's Altar ) to recast himself from the graveyard? Balthor the Defiled for extra reanimation duty and Carrion Feeder for a very effective on tribe sacrifice outlet. 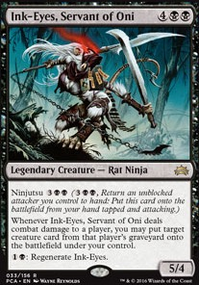 I would add Mikaeus, the Unhallowed as he combined with sacrifice outlets like Carrion Feeder that can get out of hand, your opponents are in REAL trouble if you have Rooftop Storm and Havengul Lich with him. Heya Dazzla, Scarab God is definitely a fun deck. Going for the synergy build is pretty good. Here might be some cards you can consider as well. Liliana, the Last Hope , she stalls, she recurs, and as her ult she gives you recurring Zombies at the end step at each of your turn, she is pretty much one of the best cards you can acquire for your deck. Her price albeit is rising exponentially, I would try obtain one. 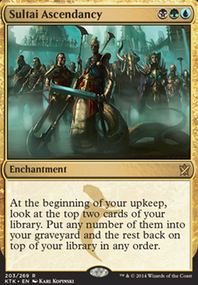 Endless Ranks of the Dead , pretty much the ult version of the above Liliana. It stacks and progressively gets worse the longer someone doesn't get rid of it. 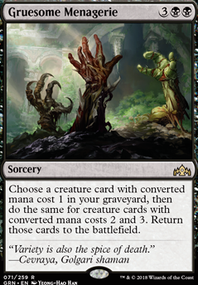 Training Grounds , reduces the cost of your commanders ability as well as a few other creatures that you run. Cemetery Reaper , another lord as well as gravehate for other players. 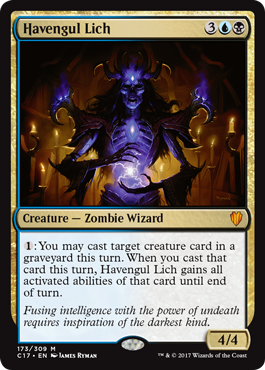 Havengul Lich , Fun card, but very mana intensive, great for a creature based meta. 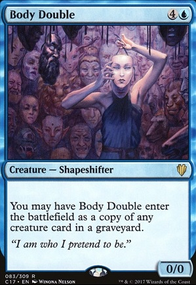 Mystic Remora / Rhystic Study / Phyrexian Arena , Card draw engines, a must for any decent decks. 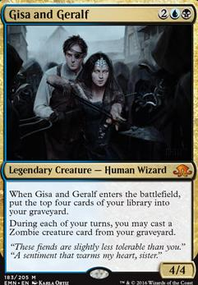 Graveborn Muse , a high risk high reward card, as said earlier card draw is essential. Hope that helps and feel free to ask for any advice! Hey ZeroSen, I’m glad you like it. It’s rly a ton of fun to play. Bojuka Bog can be countered with Siren Stormtamer . It counters stuff like Tormod's Crypt too. I like the river kelpie. It’s a part of my infinite Kokusho combo and I never milled myself to death. Since Hedron Crab can mill opponents if you sac your worldshaper you’re fine. Just don’t target yourself with the crab after a worldshaper died. Vraska the unseen is nice but I like the treasure tokens. They help me to play my opponents creatures with cards like Havengul Lich . Main reason for relic seeker is the fact she comes with 6 loyalty. I can -3 her twice, she dies and can be recast. I can destroy every turn. For the unseen you have to -3, +1, -3 because of the 5 loyalty and lose 1 turn destruction. 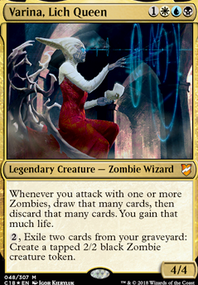 Don't forget Cemetery Reaper , Cryptbreaker , Havengul Lich , Prized Amalgam , Risen Executioner , Wonder , Tidehollow Sculler , Zombie Master , Graveborn Muse , and, if the $$ is still right : Mikaeus, the Unhallowed , and Sidisi, Undead Vizier . One or two of those FLABBY tutors for Buried Alive and the like.